Are you feeling fully prepared for Small Business Saturday in terms of your buzz, sales, PR, social media, and all that jazz? Need some ideas to make your own? Never fear: I’ve got your back – in a big way! 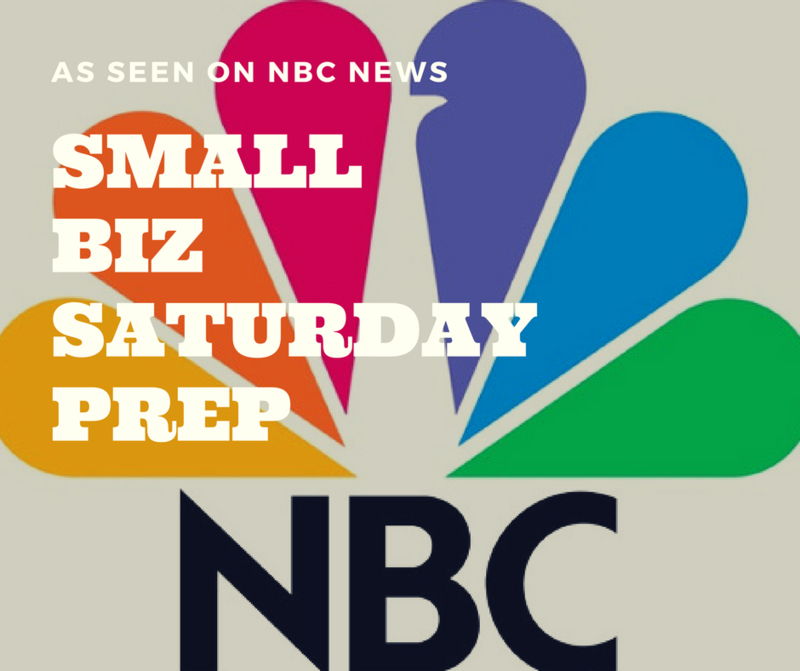 This past weekend I was featured alongside a couple of my entrepreneurial sheroes and a few other small business media stars in a story by NBC News and J.J. Ramberg (host of MSNBC’s Your Business) sharing tips that will help prepare you for Small Biz Saturday (this weekend). I’ve linked to the article via the image and below it, I’ve included 19 BONUS TIPS (Hello! My ideas for you couldn’t be contained in a quick media soundbite) that you still have time to implement before the celebratory shopping weekend! Have a strategy of your own that you’re taking action on? Be sure you share it with us in the comments below the blog! It’s important that small business owners recognize the power of collaboration over the competition during shopping weekend like this. By cross-promoting with other businesses in their city (for brick and mortar) or online (for virtual shops), you’ll exponentially increase your chance not only for visibility and sales this weekend, but for future sales from the relationships, you’ll create with potential future customers. Promotional blog posts and social media posts – Try creating a gift guide featuring each others products or a must-have list that includes other businesses. Newsletters – Mention each other as must-shop places, share featured products and sales of partner businesses, and encourage shopping by boosting discounts when people shop at more than one of your stores! This is a shopping weekend during which shoppers expect to experience special sales – so raise your game & percentages off on what and HOW you’re offering deals, this also means you want to offer items people will actually be interested in, don’t simply clear out old stock. Offer an additional promotion code with their purchase (whether it’s in person or online) with a deadline to encourage spending as soon as the same weekend. Double discounts = a larger chance of future shopping. Everyone loves sharing an exclusive bargain! Let them share a sale or promotion with a friend. Remember, you need to remind them to do this, within the newsletter or physical coupon code you give them. You can also share this shopping love with their friends and family via newsletters and social media. Help them realize they need to act fast: Create a sense of urgency by offering flash sales on specific items throughout the shopping holiday weekend and especially during Small Biz Saturday. Use social media to help spread the news of what’s on sale NOW. This is a great promotion to support on Facebook, InstaStory – even SnapChat – depending on where your audience lives online. Collaborate and cross-promote with other stores in your neighborhood or city. Share marketing materials in your store, include shared promotional material – even incorporate each other into your social media posts. Further, encourage shopping around the neighborhood by giving increased discounts with “proof of purchase” from other local stores. You can easily do this by creating a “Shopping Tic Tac Toe” card to fill out with other local businesses. Offer “extras” in your store this weekend: Gift wrapping, entertainment, a children’s craft center to keep kids busy while parents shop. Consider tempting them to stop in with not only your sale, but a party atmosphere – cupcakes from the local bakery, cocktails to celebrate small business (a Made-by-Hand Martini, anyone) and make the shopping process just as much fun as the purchase will be for them. Don’t wait until Small Biz Saturday weekend to let people know you’ve got something special happening in-store for Small Biz Saturday, many people are making their shopping plans now! Let them know they should include your store on their list – and entice them with your special offers. Don’t fear losing business here, imagine the increased awareness and foot traffic! Speaking of increased foot traffic – consider special, longer hours for this weekend – and share them prominently on your store windows and social media feed. Visuals for the win! Make sure your store is attractive inside and out – balloons, signage, whatever works with your aesthetic – to shoppers attention. Small Biz Saturday is a fantastic time to invite local media (television, newspaper, hyper-local blogs) into your business for a visual and inspiring story. Be sure you invite them in, but make the story more than a commercial for your sale. Instead, invite them to go behind-the-scenes with a local business as they prep and face the busy shopping season. Pull back the curtain and let them see you creating your products or preparing for the sale. Offer a story that will be highly visual to them, and timely, you are a local angle of a hot national news topic this SBS weekend, but you don’t want to make it feel like a commercial. Find other parts of your story beyond the sale that can be highlighted in a news story: Did you go from X to entrepreneur (teacher to entrepreneur? Retired to a local shop owner? Wall Street Banker to Main Street Baker) this is a great time to share this story within your SBS feature! Be sure you update your photos on your covers and in your feed in general. Work now, using easy-to-use programs like Canva and PicMonkey (no PhotoShop skills required) to create new photos for this shopping season for your cover photo on Facebook. Show behind the scenes photos of you prepping for the big sales – get people excited! Also remember, the more you can show the “real you” behind your business, the more you can personally connect with those you are trying to build a long-term relationship with. Personal connections lead to trust and likeability which lead to sales! Encourage and reward (with special discounts) customers who share that they’re shopping with you online/offline in photos on social media. Create hashtags for this or ask them to tag your shop so that you can easily identify them. Use Pinterest to create shopping lists and sales guides – this can also be down with your cross-promotional partners to increase reach and visibility! Be sure you share your entire SBS journey via InstaStory, take your audience along for the entire ride! This seems simple but sometimes we’re so caught up in planning that we forget to include everyone on our team during this sales planning process. I can still remember calling a store to find out about their Small Biz Saturday plans and the person answering the phone had no idea what they were. Be sure everyone is excited, aware, and well-versed on some sales-worthy talking points that they can share starting this week when seeing people in person, talking on the phone, etc. Small Biz Saturday won’t just bring sales and foot traffic to your store, it will bring people to your website and social media feeds as well! Be sure you’ve given them a once over and “stage them” as a real estate agent would, making sure people get to know you and your business in the best possible way. Key places to review and “stage” include: Your blog, your social media feeds, and your website’s “about us” and “bio” sections. Ask yourself if they’re up-to-date and sharing a glimpse at your business that you’re proud of, in other words, that they’re not a social media feed spent yelling at airlines or stalking a member of the press in a spam-like fashion! Websites and social media feeds are like the new business card, treat them as such! These tips aren’t meant to work for every single business, every sales holiday. Figure out what works best for you in terms of your bandwidth and availability as well as your brand style and voice, and go for it! Remember, you aren’t just working to create sales right now, you’re also building relationships with current and potential customers for a (hopefully) long-term, valuable relationship with them! 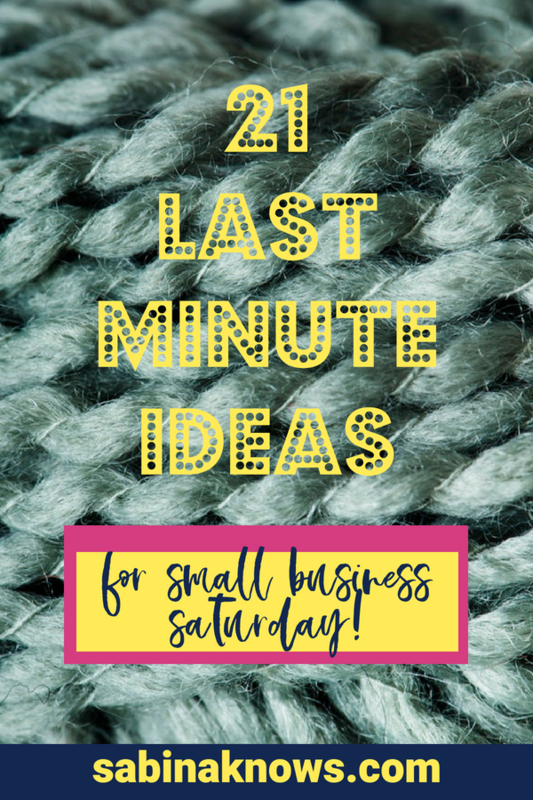 What activities are going to be happening this Small Biz Saturday at your business? Let us know in the comments below so we can check them out!